Today we want to introduce a very popular game on Facebook. There are many games now available now, such as Diamond Dash, Castleville, and our favorite, Tetris Battle. 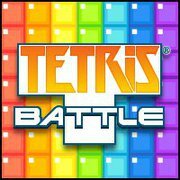 Tetris Battles’ rules are as same as the original Tetris, but it is played differently. There are 2P, 3P, and 6P modes, which means that you can play with two, three, or six people together. Moreover, you can play with people randomly selected from among players around the world! Each game lasts two minutes. We love the 2P mode most. You can play with others one after another, and you win by getting more knock-outs. We didn’t know about this game at first. Our friends recommended it to us. Now, we love it very much. We didn’t have any skills in the beginning, so we always lost to our friends. After we had played and practiced it every day, we were really happy that we could finally beat them. There are good reasons why you should play Tetris Battle. First, playing it trains our brain. For example, when you think how to arrange the falling square blocks to form a line, you are training your space conception. Also, when you spin the blocks in order to match the new blocks with the bottom blocks – and match them faster and faster – you are training your hand-eye coordination. Besides training our brains, playing Tetris Battle is a great way to kill time when you are bored. However, there are also some reasons why you shouldn’t play Tetris Battle. As everybody knows, many people become addicted to video games, especially young people. Also, because you have to concentrate and fix your eyes on the screen, you will get screen sickness easily. No matter whether you win or lose, you will want to try again and again. Then you will forget the time. Therefore, when you start to play Tetris Battle, you must think about how to control your time. Maybe you can set your alarm to remind you to stop. People have been playing the original Tetris for an incredible thirty years. However, because the game company keeps updating Tetris and making it more complex and challenging, the players keep increasing. We recommend Tetris Battle. It’s good for training and entertainment, and you can make manyfriends with players around the world. Just be careful not to get hooked!